Entravision EDGE | Just When You Thought You’ve Seen It All! Just When You Thought You’ve Seen It All! Last year, Erazno mixed his passion for boxing with a dare that placed him center stage not at a concert, but inside a boxing ring! 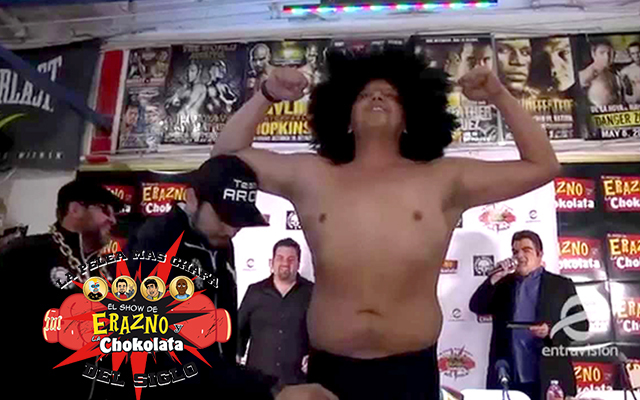 Erazno, headliner of the #1 Spanish-language radio program “Erazno y La Chokolata,” took matters into his own hands and challenged his show sidekicks to a boxing tournament. The first ever, “La Pelea Más Chafa” (“One Cheap Boxing Match”) included a streamed weigh-in event, plenty of hype, and real (though it started as staged) boxing matches from an original premiere boxing venue in LA, the Olympic Auditorium. After a KO in the last round, Erazno was pronounced the Champion and two lucky fans won an all-expense paid trip to Las Vegas to watch the real fight of the century, Mayweather vs. “Canelo” Alvarez. This year, Erazno returns to his roots and love for wrestling (hence the mask he never removes) to stage “La Lucha Más Chafa”. The training has begun, the stakes are higher and the prizes for fans are bigger. The event kicks off with an official press conference on June 30th, where each “wrestler” will try to intimidate the other. Then, on July 7th, they will wrestle each other for coveted bragging rights. It will be one crazy night in Huntington Park, filled with comedy, live music, and tons of wrestling action. Will Erazno successfully defend his title? Let’s just hope he doesn’t lose his mask!